It is difficult to break hard ground with a shovel manually. If you live in an area with tough soil or clay, you will want to consider a rear tine garden tiller. Rear tine garden tillers have blades in the back of the tiller and are driven by the engine to help break up hard ground. We have reviewed several rear tine garden tillers and their features for your consideration. Have you ever tried to loosen up soil in your garden with a shovel? It is not very easy to do. Rear tine garden tillers allow you to break soil effortlessly. They do the hard work that you would otherwise have to do with a shovel manually. Below, we have shared our 6 favorite rear tine garden tillers for your review. This Champion rear tine tiller features dual rotation tilling. This allows you to switch from forward to reverse quickly for more tilling flexibility. The Champion tiller has a 19-inch tilling width and an 8-inch tilling depth. The four heavy-duty steel tines are 13.8 inches long and are designed to break up hard soil with minimal effort. The cast-iron transmission is mounted inside a heavy-duty cast-iron case and is powered by a 212cc (cubic centimeter) engine. This tiller has 13-inch self-propelled tires that will provide mobility over uneven terrain. The large treads give you solid traction. With self-propelling tires, you can guide the tiller while it does the hard work of digging up the terrain. Champion offers a 2-year limited warranty with technical support for the life of your tiller. If you are looking for a powerful and efficient rear tine garden tiller, then consider buying this Champion product. Southland’s rear tine tiller offers counter rotating tines. The forward momentum from the tires combined with and the counter rotation of the tines allows you to till your soil easily. Counter rotating tines are perfect for tilling hard or clay soil. The 11-inch tines on this Southland tiller are self-sharpening. 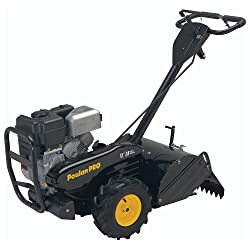 They provide an 18-inch tilling width and a 10-inch tilling depth. A convenient depth regulator lever allows you to control the depth of your tilling. 13-inch pneumatic tires will move the tiller over any type of tough terrain. This rear tine tiller has a 196cc 4-cycle OHV (overhead valve) engine powerful enough to till through any hard soil. 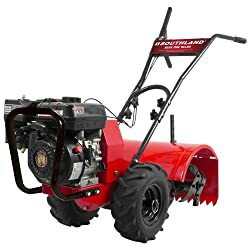 This Southland tiller has a manual recoil start and folding pistol grip handles. Southland offers a 2-year limited warranty with this product. This black, EPA-certified rear tine garden tiller is a great bargain for your tilling and gardening needs. A 208cc OHV engine powers this Yard Machines rear tine tiller. 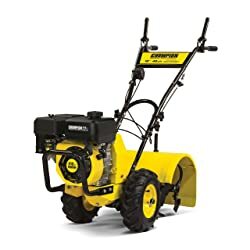 It has 12-inch counter rotating steel tines with an 18-inch tilling width and a 6-inch tilling depth. The 22-inch tine shield helps to prevent dirt from flying everywhere as you are tilling. This tiller features a loop and bail handle and has a handle height adjuster. The 13-inch tires allow this tiller to maneuver easily over any type of uneven ground. Yard machines backs this product with a 2-year warranty. 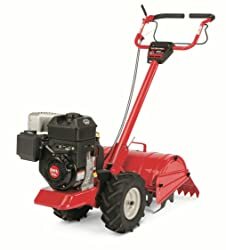 This tiller has a 208cc Briggs & Stratton engine with 9.5 foot pounds of torque and 190 rpm (rotations per minute). The 13-inch self-sharpening tines are dual rotating which gives you more flexibility in tilling various types of soil over any terrain. The YARDMAX tiller has an 18-inch tilling width and a 6.5-inch tilling depth. There are 7 depth adjustments giving you many options for shallow or deep tilling. The single hand operation allows you to stand and steer from either side of the tiller. The adjustable drag bar gives you optimal balance in any type of terrain. Front counterweights on the 13-inch pneumatic tires provides balance and stability for this tiller. There are adjustable side safety shields and a serrated rear shield to make sure you have adequate protection from the rotating tines during operation. YARDMAX provides a 2-year warranty on this rear tine tiller. 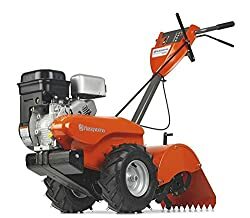 The CRT900 Husqvarna tiller has a powerful Briggs & Stratton with 9 foot pounds of torque. It has a rotational speed of 3200 rpm and a chain/gear type of transmission. Counter rotating 14-inch tines allow for deep soil penetration. Counterweights over the wheels make sure that this rear tine tiller remains stable and balanced over all terrain types. There is an easy-to-adjust drag bar which offers balance while tilling. The adjustable handlebar gives you operating flexibility while tilling. You can power the tiller in both forward and reverse directions. 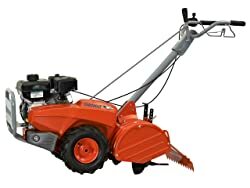 This Husqvarna tiller has a 14-inch working width and a 6-inch working depth. 7 depth adjustments give you flexibility for shallow or deep tilling. The powerful engine on this tiller combined with the tine depth flexibility makes this tiller an easy choice for your gardening and tilling needs. The Poulan Pro features a Liquid Combustion Technology OHV engine with 208cc cylinder displacement. It has a heavy-duty chain drive transmission with a power reverse feature giving you added flexibility for all soil types. The 13-inch counter rotating tines offer a 17-inch tilling width and 6.5-inch tilling depth. 7 depth adjustments allow you ultimate flexibility in tilling depth. The 16-inch tires provide wide traction and balance for uneven terrain. You can raise or lower the split loop adjustable handle based on your individual needs. This type of handle allows you to operate this tiller one-handed from either side of the machine. Poulan offers a 2-year warranty on this rear tine tiller. The wheels on rear tine tillers are designed to be driven by the engine. This means that the tines work independently from the wheels allowing you to till the ground into soft garden soil ready for planting. There are many features to consider when searching for the best rear tine garden tiller. We offer guidelines below to help you make the right choice for your tilling needs. There are different types of rotation styles available for rear tine garden tillers. Depending on your individual needs, you will want to consider each of these options carefully before deciding on a specific tiller. Counter rotating tines: Many rear tine garden tillers have tines that rotate counter-clockwise. With this type of rotation, the tines rotate counter-clockwise while the wheels propel the garden tiller forward. This combination of motion breaks up the soil as efficiently as possible. The independent blade movement does not rely on the momentum of the wheels for tilling speed. These types of tines are ideal for difficult soils such as compact clay. Dual rotating tines: Rear tine garden tillers that have dual rotating tines are similar to tillers with counter rotating tines. The difference is that the blades on a dual rotating tiller can operate in both a forward and a reverse direction. A tiller with dual rotating tines is considered a high-end more heavy-duty machine. This type of tiller provides you with the most flexibility for your tilling and gardening needs. Standard-rotating tines: These types of tines rotate in the same direction as the wheels. Sometimes referred to as forward rotating tine tillers, these types of machines are ideal for shallow depth tilling. Standard-rotating tines also work better in softer ground. If you will till hard soil, then you need to be sure you have a rear tine garden tiller that can handle the job. For hard soil and rough terrain, you want a transmission that has both forward and reverse speeds. This allows you to back up and re-till an area in a safe manner. If you buy a tiller that cannot reverse, then you may encounter more challenges if the tiller ever gets stuck. It will be difficult to get it unstuck without the ability to place the machine in reverse. There are some rear tine garden tillers that have a multi-speed transmission for forward motion. A multi-speed transmission is nice if you want to control how quickly the tiller will move. The tilling depth of a rear tine garden tiller is very important to consider. Many garden tillers include an adjustable tilling depth feature. Depth adjustment is a great option when there are multiple areas to till with differing planting requirements. If you have a small job to complete, rear tine garden tillers with a shallower tilling depth may be all you need. Larger jobs and hard soil or clay may need a tiller with more depth to make sure the soil is loosened for your planting and gardening needs. Rear tine garden tillers have varying tilling widths. Consider the terrain of the area you will till as tillers with wide tilling width may be difficult to control. You need to consider how well you can balance the tiller and control the machine while it is operating. The size of tires on a rear tine garden tiller will determine how well you can control the machine. Tires with a narrow design and large tread will give you the maximum traction while tilling. If you have uneven terrain that requires tilling, you want to consider wider tires. Wider tires will give you more balance and control as you are tilling. Tine tillers have various types of handlebars. Many of the handlebars are stationary without any adjustment capabilities. There are some you can adjust to give you flexibility based on your individual height. Adjustable handlebars will improve your ability to control the tiller. If the handlebar is adjustable to the right height, you will be more comfortable operating the tiller over an extended period of time. Most rear tine garden tillers have steel tines. The diameter of the tines will help define the tilling depth capabilities. When you are looking for a garden tiller, consider ones that have both side safety shields and a rear safety shield. This level of protection will significantly reduce the risk of injury from the long, fast rotating tines. Many tillers have counterweights positioned over the tires. This is a very important feature to look for in a rear tine garden tiller. If the tiller is stationary, counterweights prevent the tiller from falling over. While you are operating the machine, the counterweights will contribute to the balance and stability of the tiller. We have given you a lot of features to consider when searching for rear tine garden tillers. Many high-quality tillers have powerful engines and tilling depths adequate for most tilling jobs. Be sure the type of tine rotation will work based on the area and terrain you need to till. If you take all these features into consideration, you will choose the perfect tiller for your needs.